Obdulia “Tulie” Trejo is the 91 year old sister of Armida Piña, one of the women who shared her Neighborhood House stories in the article “The Lives of Girls“. Tulie says that she raised her younger sister Armida. She invited me to her home in Chula Vista to show me her many baking trophies and to talk about her own memories of Neighborhood House. Neighborhood House was a place where Tulie, a bright young girl in the 1930s, could learn and excel. She remembers how the pre- school and kindergarten age children would skip from house to house singing “a tisket a taskit, a green and yellow basket” on their way to the classes held at Neighborhood House. The group was led by Lupita Evers, who was employed by Neighborhood House. Collecting the little ones and leading them to Neighborhood House was one of Lupita’s duties. Tulie learned to bake at Neighborhood House. She would soon excel at this art. At the age of 10 while at Neighborhood House, she won her first blue ribbon for baking a white and silver cake with lots of frosting and coconut on top. She remembers the cooking teacher taking her upstairs where Miss Anita Jones, Neighborhood House director, was taking a nap. It was Miss Jones who would award her that blue ribbon. Later in her adult years Tulie would win the Pillsbury bake-off as well as other baking contests. She says she has always credited Neighborhood House for starting her on her successful baking career. Neighborhood House had a group of little girls who were referred to as the Clinic Club. This club was formed in the late 1930’s and started with the question: “How many of you want to be a nurse?” Tulie’s arm shot right up, and along with several other girls including Isabel Amador, Mike Amador‘s sister, the Clinic Club was formed. The girls wore little white uniforms and would report to Neighborhood House on Saturday morning. They were allowed to watch whatever procedures the doctors were performing. Tulie remembered seeing a man having some kind of growth removed from his back as part of her Clinic Club responsibilities. The nurse in charge was Wilfreda Brackett, and along with her little charges, she would assist with various medical procedures. Tulie loved this class even though it meant she had to study a medical book and give up her Saturday morning. One day she proudly took her book home to show her mother what she was learning. Her mother saw something in the book she didn’t like and Tulie was made to quit the clinic club. Tulie thinks the book had some pictures of the human body and her mother felt this was inappropriate for her daughter to read. Books were not allowed in the house. Tulie remembered that one time that her brothers brought home some comic books and her mother threw them in the wood stove and burned them. Her aunt brought her a copy of “The Adventures of Tom Sawyer”. Tulie was thrilled with this gift. In order to read this book she had to hide under the house. Tulie’s home life was chaotic, impoverished and abusive. Her parents restricted their daughter’s educational pursuits and imposed limits on the ways she could express her interests. Neighborhood House was clearly a refuge, a safe place for Tulie. Like the other kids, Tulie loved camp. She remembered that they all went to Camp Dehesa in a big flatbed truck. Mary Cunningham, a 19 or 20 year Neighborhood House employee, was the person who took the girls to camp. The payment arrangement was that you could bring a dollar to pay for a week’s stay at camp or bring a bag of potatoes or a bag of beans. The food payments were given to Lupita Evers and you were marked as having paid for camp. At night there would be spooky stories, while the day was spent learning about nature and playing outdoors. She took Mexican dance class at Neighborhood House and remembers dancing at the Balboa Park Exposition of 1935-36. Miss Jones had a car and would take the girls on field trips on a first come, first served basis. Tulie made sure she would be at Neighborhood House early in order to assure her seat in the car. Mondays were free days at the Expo and Tulie went whenever she had the opportunity to go. 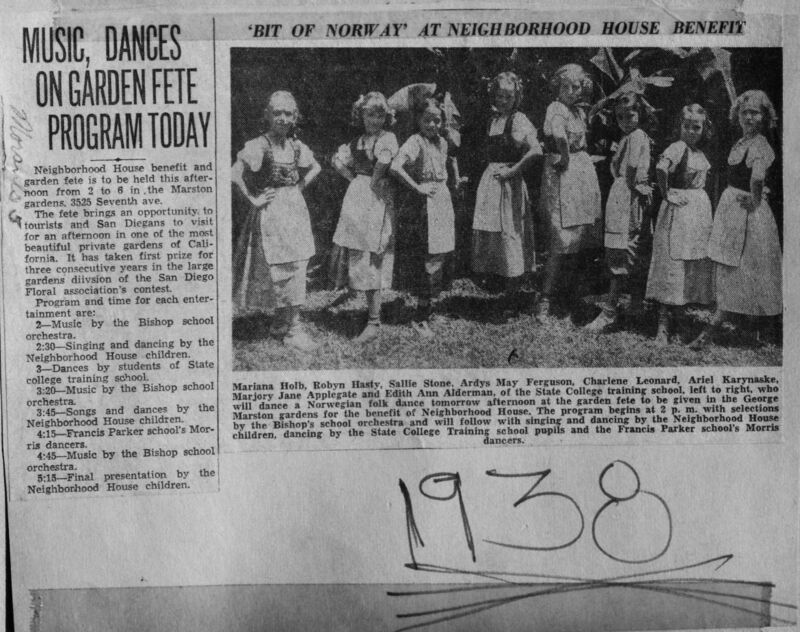 The dance class also gave her the opportunity to perform at one of the garden parties held in the gardens of the Marston House. She described dancing in a Southern- themed play. The song she danced to was Dixie and a women named Maria played the piano. She remembered everyone clapping at the end of the performance. Christmas often brought a donation of used toys to be passed out at Neighborhood House. The kids would line up and presents were selected on a first come, first served basis. She selected a beautiful doll dressed like a baby. This was her favorite toy. On another occasion she selected a bag of beads. Her mother was angry that she had chosen beads over something more practical such as a pair of shoes. Neighbor House volunteers would also take the kids to the YMCA to select shoes for them to wear. At the “Y” there would be shelves of shoes. The kids were allowed to select the shoes they wanted to take home. Tulie remembers her selection was a pair of black patent leather shoes with a black ribbon and taps. When she returned home her mother took one look at the tap shoes and became hysterical with her choice of shoes. Tulie and her parents had a great deal of conflict. She remembers a period of time when the only conversation between them was for her to respond with a “yes” or “no” to whatever question she was asked. Tulie said that her mother was never affectionate.There was also a conflict between her and her atheist father. She recalls coming home from church with a religious pamphlet which Mr. Piña grabbed out of her hand, threw it on the floor and stomped all over it. Her grandmother, her father’s mother whom she dearly loved, was very religious and she could not understand her son’s reaction. For a variety of reasons Tulie and her parents were becoming estranged, in part because of her independent style and her determination to finish high school. She would also confront her father when he spent two or three nights away from home. This added to the conflict between her and her father. She loved school and desperately wanted her high school diploma. She says finishing high school was always her focus. She says she never ditched school because they would take you to Juvenile Hall and she did not want to give the women in the neighborhood something to gossip about. As a pre-teen or teen, it was Tulie responsibility to take her little brothers for their immunizations or checkup at the clinic at Neighborhood House. With a family of fourteen children, two of which had passed away, it seemed there was always someone that had to be taken to the clinic. Her mother did not take them. The officers did not arrest her father, saying “If we arrest him who will feed all these children?” Her mother felt there was nothing she could do to change her situation. Tulie believes that her father did not want his wife to leave the house. It seemed as though every year she would take one little brother or the other to the clinic. The nurse would tease her about her having another baby. Tulie would explain that this was another sibling. She did attend the dances held at Neighborhood House. She would go with her brothers. Her father would then go to Neighborhood House, stand at the door and yell her name from the doorway. She would then have to leave the dance. She always told her mom that she would marry a Mexican and if he abused her, she would hit him with a skillet. On various occasion the cops had come to her home when her father was beating her mother. The officers did not arrest her father, saying “If we arrest him who will feed all these children?” Her mother felt there was nothing she could do to change her situation. Tulie says that the boys in the neighborhood were afraid of her father. Through Neighborhood House she got an after school babysitting job. She would take the bus to her job. Neighborhood House served as a placement center. With her baby sitting job she was able to buy her own shoes and clothes. The job also enabled her to save a little money. Even though she was living at home there was very little interaction with her parents. Tulie moved out of her parents’ house and went to live with a girlfriend, Dolores, and her mother. At the age of 17, she met Joe Trejo, a young man from Carlsbad, at the waterfront near the foot of Broadway. Part II of Tulie’s story will continue next week. What a wonderful series of stories. If Maria Garcia could send me her email address, I would like to send an article from the January 4 1957 Colliers Magazine. It is an article titled: 18,000,000 Teenagers Can’t Be Wrong. In part of the article on the state of the younger generation, it profiles the Carriedo family and the success of the boys in their school and tennis endeavors. When I googled the boys names, your article came to me. How exciting that you wrote about the Carriedo family more than 57 years after they were profiled in a national magazine as a wonderful example of a successful family from Logan Heights. Congrats on your Women of the Year award Maria! Thank you Val. Women like your grandmother made it happen. I am very proud to have received this recognition. Such powerful, truthful storytelling, Maria. I love the way you share even the painful parts of Tulia’s story. Her photo shows us her vibrant spirit, and knowing that she succeeded so brilliantly in spite of obstacles and fear within the family brings this truth out of the silence. Thank you!